The Chocolate Zuccotto Cake from Maggiano’s has been a long-time favorite of mine. Even after sharing several family-style Italian dishes, I can always find room for this fudgy, chocolatey concoction. My boyfriend and I were at Macy’s and they were having a special event where Maggiano’s was serving bite-sized samples to shoppers. Instead of the cake, they had cake balls, which were tiny bites of heaven. Rob doesn’t like overly-chocolate desserts (crazy, I know), but he loved these! 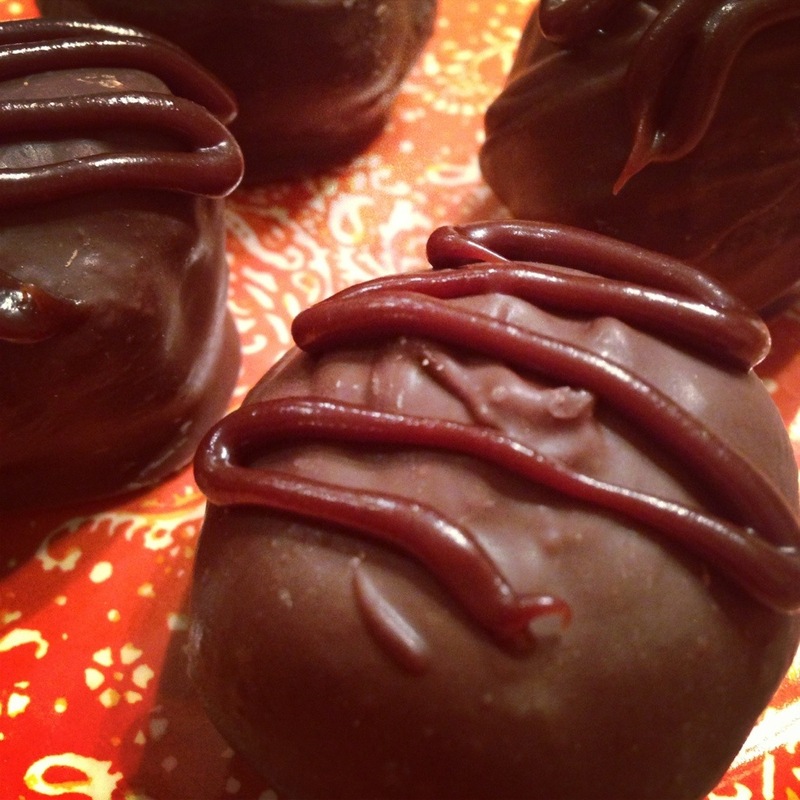 Hence this recipe that tried to replicate these tasty treats – and, in our opinion, succeeded! Preheat oven to 350F. Lightly grease 9″ x 12″ cake pan and set aside. In the bowl of a standing mixer, beat together eggs, milk, canola oil and vanilla. Mix in sugar until combined. In a large bowl, mix together flour, cocoa powder, baking powder, baking soda and salt. On low speed, gradually mix into egg mixture until fully incorporated. Mix in boiling water. Batter will be thin. Pour into prepared cake pan and cook for 25-30 minutes, until toothpick comes out clean. Set aside to cool. Once cool, use hands to break into crumbles. In a microwavable bowl, combine chocolate and 1/2 cup whipping cream. Heat for 1 to 2 minutes, stirring every 30 seconds, until smooth. Let cool. In the bowl of electric mixer, beat remaining 2 1/2 cups of whipping cream until soft. Mix in chocolate mixture on medium speed until combined. This should be the consistency of a chocolate ganache, but fluffier. Set aside. In another bowl, heat chocolate and butter in microwave for 1 to 1/2 minutes, until melted and smooth when stirred. Let cool. In a large bowl, whisk 1 cup heavy whipping cream until thickened. Add powdered sugar and continue whisking until it reaches the consistency of whipped cream. Add cooled, melted chocolate and whisk just until incorporated. In the bowl of a standing mixer combine cake crumbles, ganache and mousse. I did this in two batches, so I used half of each. Place cake mixture into large bowl and refrigerate until hard enough to roll into balls. Line cooking sheet with parchment paper and roll into small balls. Place back in fridge until re-hardened. 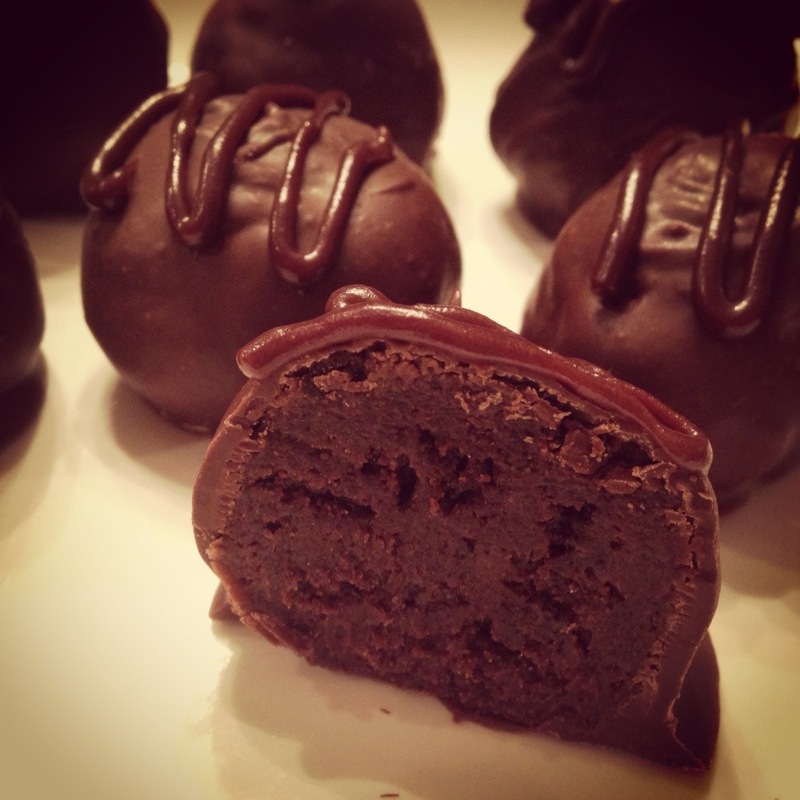 Melt chocolate and dip balls, then place on wax paper lined baking sheet. Place in fridge to harden. Serve chilled and store in fridge. Wow, this is an impressive recipe! Looks incredible! This looks great! Like something store-bought. I hope to give it a shot soon!